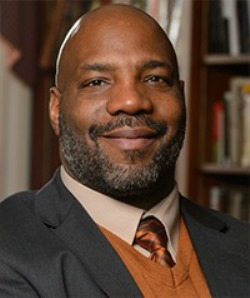 Dr. William Jelani Cobb currently is an associate professor of history and director of the African Studies Institute at the University of Connecticut. Dr. William Jelani Cobb, a prolific Black historian and journalist, is joining the faculty of Columbia University’s Graduate School of Journalism. Cobb, who is currently an associate professor of history and director of the African Studies Institute at the University of Connecticut, is also a staff writer for The New Yorker and regularly writes about race, politics, history and culture. At Columbia, he will hold the Ira Lipman professorship. “As someone who writes about race and civil rights, the position mirrors a lot of what I was interested in,” said Cobb, a New York native who earned a Ph.D. in American history from Rutgers University. His dissertation adviser was Dr. David Levering Lewis, a prominent scholar and Pulitzer Prize-winning biographer of W.E.B. Du Bois. Cobb said that his relationship with the Ivy League institution, which houses one of the most respected graduate schools of journalism in the world, developed after he delivered a few guest lectures in recent years. He previously taught at Spelman College. For years, the journalism school has increasingly felt pressure to diversify its faculty. Currently, there are only three full-time Black faculty on staff. They include documentary filmmaker June Cross; former international reporter Howard French; and former deputy managing editor of Newsday, Lonnie Isabel. Cobb, who is the author of The Substance of Hope: Barack Obama & the Paradox of Progress and winner of the Sidney Hillman Prize for Opinion and Analysis Journalism, said that there is value in having a trained historian teach journalism students. “It’s important for journalist to have a working sensibility and familiarity with archives,” he said, adding that he sees archival research skills as essential for good reporting. Samuel G. Freedman, a veteran journalist and longtime faculty member at the school, praised the hire.